Calls directly in ur mailbox daily. Markets likely to open slightly higher. Support for Nifty is at 10860 and resistance at 11000 (closing basis). Bank Nifty has support at 27200 and resistance at 27460. Any SL for nifty Ce? Yesterday I have bought BANKNIFTY 27500 CE @82, & 5 LOTS plesase advice me. I am in profit, But today global market shownig huge down !! What about Axis and Reliance today? Can i short L&T today? Hi seema, not yet. is going strong. cb sir,nifty open gap down why? oops bank stocks falling......what is the reason....bank nifty 170 points down !! Shoppers stop intraday enter ? Note: rel="nofollow" in use - do not spam, do not advertise! The calls given here are My Personal views, Trading or investing in stocks is a high risk activity. Any action you choose to take in the markets is totally your own responsibility. NSEGUIDE will not be liable for any, direct or indirect, consequential or incidental damages or loss arising out of the use of this information. Investors should be cautious about any and all stock recommendations and should consider the source of any advice on stock selection. Various factors, including personal or corporate ownership, may influence or factor into an expert’s stock analysis or opinion. 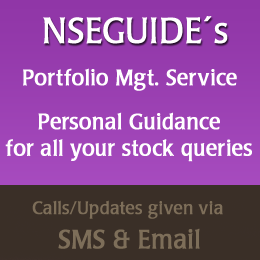 The Stock calls recommended by NSEGUIDE can be used by you to invest & share it with your friends, but you are not allowed to publish it on your own or some website/blog without prior permission. This is YOUR site, so if you have suggestions or feedback on how we can improve it for you, please feel free to speak up! We will try our best to keep up with it!